3 done so only 46 to go - LOL. The papers still need to be removed - that's why they seem a bit off color in the photo. No focus flower in this one. Took me about an hour to do. I hope I get faster at this. I'm using freezer paper for my templates and gluing them instead of basting. 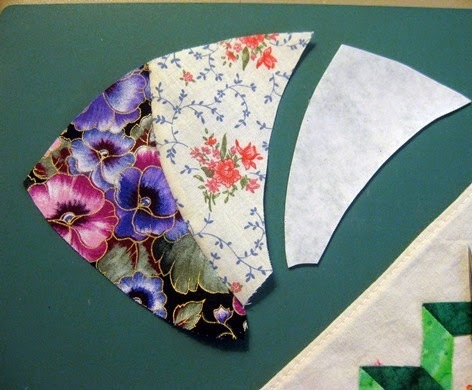 So far, so good doing them by hand- best seam allowances ever for me. Can I get a whoop, whoop for a new technique? For the paper pieces, according to Random.org, Kathy in the Ozarks! The winner of the 100 Block issue is Susan @ CQ4fun. Welcome winners! Send me a snail mail and I'll send your winning along in the coming week. 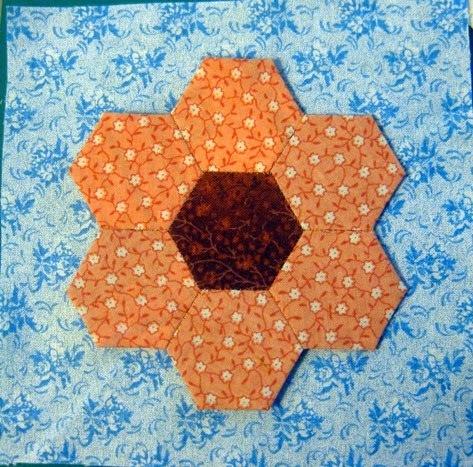 Okay, I've shown you my hexies, show me your's! Linky below. Remember it can be a finished project, a new project or one you are thinking of doing. End's Monday, midnight. I'm linking to Richard's Link a Finish Friday, Sarah's Can I Get a Whoop, Whoop, and One Flower Wednesday. that EPP circle looks interesting.... not that I'd attempt the dreaded EPP again! I've yet to try EPP with curves; but I hope to one day. I like the colors in yours so far. Pretty orange flower! The circle looks like fun. Lovely orange flower. It will look beautiful in your garden. Making circles using EPP looks fascinating to me too. Off to check out the link.